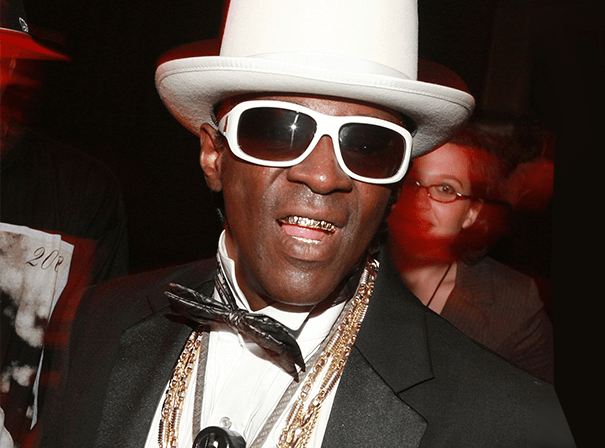 Flavor Flav is one of the most recognisable and celebrated rappers of his generation. As well as laying down famous verses as part of prominent hip hop group Public Enemy, he is a television personality, a comedian and actor who is known for having set the template for “hype men” within a given band. That is a role he perfected with Public Enemy, with whom he toured the world, always appearing on stage yelling “Yeah boy!” and “Flavor Flav!” during performances. Since performing with the band, Flavor Flav has often been on TV shows around the world including several VH1 reality series, including The Surreal Life, Strange Love, and Flavor of Love as well as Big Brother in the UK. Born in New York in 1959, Flavor Flav is a self-taught piano player who sang in his youth choir. He met musical sparring partner and fellow Public Enemy member Chuck D at University and soon took his stage name from his graffiti tag. The band went on to define an era of hip hop and have countless hit singles and albums including 1988’s It Takes a Nation of Millions to Hold Us Back, which went double platinum, and the most iconic political single “Fight the Power”. Flavor solo rapped on many of them and was often the comic foil to the seriousness of the other band members. In 2006 he released a full solo LP Flavour of Love and also ran his own short lived chicken and rib restaurant. A likeable character with a great sense of presence who lights up any occasion, event, festival or TV show, Flavor Flav is one of a kind.